Are "Killer" Bees A Threat To People In Southern California? About 38 years ago several dozen queen honey bees from Africa were imported into Brazil for cross-breeding with other honey bees already there, with the aim of producing a bee well suited to tropical conditions. Known as the "Killer Bee," the Africanized honey bee (AHB) is a subspecies of the common European honey bee (Apis mellifera). Although it superficially resembles its docile European cousin, it has a much "meaner" disposition and is very aggressive (especially when protecting its nest). The feistiness of this bee has its origin in millions of years of intense predation in Africa by such adversaries as ants, honey badgers and humans. Shortly after its introduction into Brazil, the AHB spread very rapidly, colonizing most of tropical America and displacing other subspecies of honey bees previously imported from Europe. During the past 10 years it has spread throughout Mexico and into Texas, and has now entered Arizona and California. Over the next decade it is expected to spread across the southern third of the United States, stopping only where it reaches regions with harsh winters. 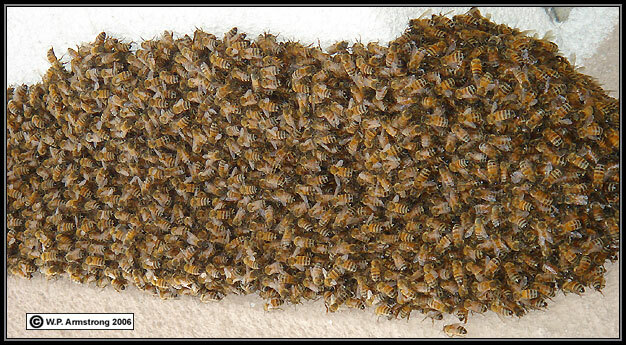 Worker female honey bees on their wax honeycomb. The hexagonal cells are used to store honey and to incubate larvae. The remarkable geometric structure of the cells provides for maximum utilization of space. 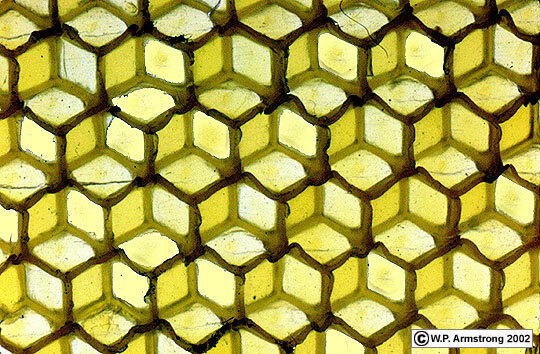 The wax honeycomb of the honey bee (Apis mellifera) is composed of two layers of hexagonal cells. One layer of cells can be accessed from the front side, and another layer can be accessed from the back side. This ingenious construction of the two layers of cells provides the maximum utilization of space. The cells are used to store honey and larvae. Larger cells are constructed by the worker bees to accommodate the male drones which develop from unfertilized eggs. Extra large cells are used for larvae of fertilized eggs which are fed "royal jelly." These special females develop into sexually mature queens. The AHB can exploit new habitats very quickly and is not particular about its nesting site. Just about any cavity in a wall, house or tree will do, with an entryway of 1/4 inch or more. The AHB stings only once and its toxin is no worse than ordinary European honey bees, but due to the extreme aggressive behavior of the AHB, a hapless passerby may be stung hundreds of times. Note: The hormone epinephrine (adrenalin) is often administered to victims of honey bee stings, particularly people with extreme hyperallergic sensitivity to proteins in honey bee venom. An injection of epinephrine may prevent the serious effects of anaphylactic shock, including circulatory failure and death. Cover your face and upper body and RUN LIKE HELL until they stop chasing you. They will pursue for up to 1/4 mile. Note: WAYNE'S WORD included a number of satirical (humorous) suggestions on what to do and what not to do if you encounter a swarm of "killer" bees. However, since these bees are moving into populated areas of the southwestern United States they could pose a serious threat to some people. Therefore, we have removed all the silly, satirical suggestions. This site will be updated with more pertinent information in the near future. A swarm of honey bees at the Barnes & Noble store in Escondido. The bees seemed relatively docile with no evidence of "killer bee" behavior.